Abstract: Eclogite and garnetiferous amphibolite pebbles were found in Miocene conglomerates directly overlying the Variscan crystalline basement of the Tisza Megaunit in the Pannonian Basin of Hungary. Peak metamorphic conditions were in the medium temperature part of the eclogite facies (600–650 °C, 13–15 kbar) with garnet, omphacitic pyroxene, quartz and rutile as primary assemblage. Breakdown from peak P-T conditions resulted in symplectitic intergrowth of clinopyroxene, plagioclase and quartz. Continuous retrogression involving garnet caused formation of the matrix assemblage of clinopyroxene, plagioclase, amphibole, ilmenite and quartz. Amphibole-plagioclase porphyroblasts formed during the last stage of retrogression. Amphibole-bearing symplectites record P-T conditions of 500–570 °C and 8–12 kbar in garnetiferous amphibolite, but no pyroxene was detected there. K-Ar geochronological data on amphibole show 348±13 Ma cooling ages which is nearly 100 Ma younger than previously suggested. Final uplift to surface conditions occurred in Miocene times causing the first appearance of exotic metabasite pebbles in clastic sedimentary rocks. 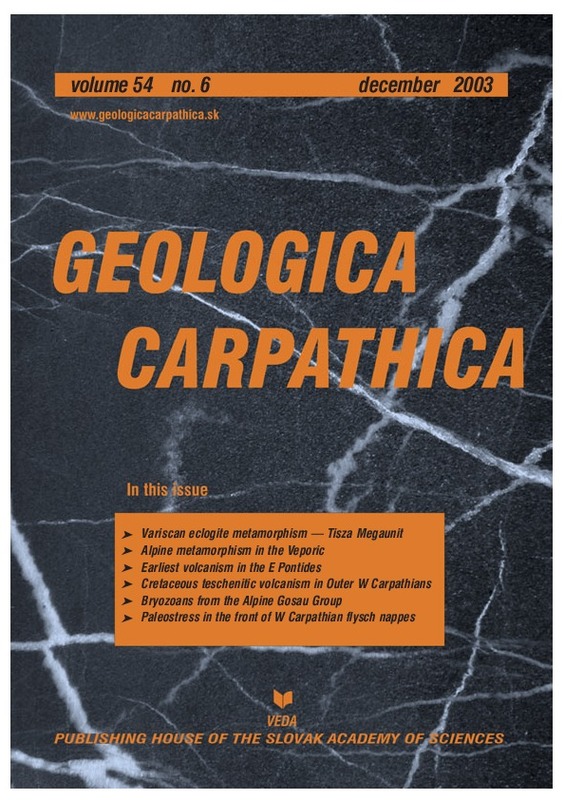 Abstract: Alpine low-grade metamorphism related to Cretaceous orogeny has been investigated in the metasediments of the Permian-Triassic cover in the Veporic Superunit, Western Carpathians. Metaclastic rocks and marbles show metamorphic grade of upper anchizonal to epizonal (greenschist facies) conditions according to the illite “crystallinity” measurements. The chlorite thermometry of Cathelineau (1988) and Jowett (1991) yields a temperature of ca. 310–330 °C in the northern part and ca. 335–380 °C in the central and eastern parts of the Veporic Superunit. A pressure of ca. 4–4.5 kbar has been obtained from the white mica, K-feldspar and biotite-bearing rocks, supposing a temperature of ca. 380 °C. The new results suggest higher temperature and lower pressure of the Alpine low-grade metamorphism than the previous estimates. The P-T conditions of the Alpine low-grade metamorphism in the Veporic Superunit are in good agreement with the observed deformational microtextures. Abstract: This study deals with the volcanic blocks occurring within the Upper Coniacian-Santonian red limestone which crops out in the Maçka area (Trabzon, NE Turkey). The red limestones are thin to medium-bedded, and mostly consist of wackestones, rich in planktonic foraminifers with subordinate radiolarians and inoceramid bivalve fragments. In the upper part of the formation, volcanic blocks occur which consist of andesite to dacite and show microlitic-porphyritic texture with plagioclase and pyroxene as phenocrysts. Chemical data indicate that these volcanic rocks are calc-alkaline in character and show similar trace and rare earth element chemical signatures with those of arc related volcanics. The limestones and the volcanic blocks are discoloured in proximity of the boundary. The contact relationships suggest that the volcanic lava blocks were still hot when they fell on the unlithified pelagic limestone muds. These data emphasize that the earliest Cretaceous volcanism started at the Late Coniacian-Santonian boundary in the Eastern Pontide volcanic arc. Abstract: New 40K/40Ar datings for teschenitic rocks in the Silesian Unit of the Outer Western Carpathians in Poland are presented. Several petrological varieties of intrusions were studied in 5 localities. Dating was performed on monomineral separates of biotites and amphiboles as well as on whole rock samples. The biotite ages (137.9–133.1 Ma — Valanginian) are significantly older than those of amphiboles (112.5–89.9 Ma — Albian–Turonian). Whole rock ages are considerably spread between those two clusters, being concordant either with ”biotite” or ”amphibole” dates or much younger. Interpretation of data poses some problems because evidence exists for hydrothermal alterations, which might influence Ar content in both minerals. Older, biotite ages are interpreted as more reliable crystallization ages, since they are close to the age of surrounding sediments and are concordant with field observations that intrusions in some cases are almost surficial. Amphibole ages are probably affected by Ar loss due to hydrothermal activity. Comparison with recently published 40Ar/39Ar datings implies that the duration of the teschenitic and related magmatism in the Silesian Basin was probably from Valanginian up to Barremian–Aptian (ca. 15 Ma). Abstract: The bryozoan fauna of the famous coral-locality Scharrergraben near Piesting, Lower Austria consists of 18 taxa, 13 of which encrust corals or more rarely rudists. This fauna is one of the richest bryozoan faunas described from the Late Santonian of Europe, a time slice in which few bryozoan faunas have been studied. Thus the fauna of Scharrergraben is an important piece in the puzzle of Santonian bryozoan biogeography. The faunal composition indicates a shallow marine, relatively strongly agitated habitat with a moderate sedimentation rate in a tropical setting. Abstract: The paleostress analysis was applied at 16 sites in the Mesozoic limestones, which are tectonically incorporated into the Cretaceous and the Paleogene strata on the front of the West Carpathian flysch nappes (South Moravia, Czech Republic). 25 solutions were obtained. These solutions can be divided into two groups. The first group represents the paleostress field with predominantly NW-SE compression and NE-SW extension connected with the Early Neogene movements of the Zdanice Nappe. The azimuth of eigenvector of acceptable σ1 axes varies from 97° up to 167°. This variability can be explained by rotation of individual tectonic slices of the Zdanice Nappe during the movement of this nappe. The different tectonic scales probably rotated in different directions (anticlockwise rotation in the case of some scales, clockwise rotation in the case of others). The second group of solutions represents the paleostress field with NE-SW compression and NW-SE extension.